Thousands of demonstrators marching on the Delmas Road through Port-au-Prince on Nov. 18, 2018. 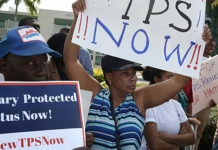 Haiti has been in complete turmoil over the three days since Nov. 18, 2018, when tens of thousands of Haitians took to the streets around the country to demand President Jovenel Moïse’s resignation and the prosecution of those who embezzled billions of dollars from the PetroCaribe Fund, established in 2006 through a bilateral accord between Venezuela and Haiti. The date marked the 215th anniversary of the Battle of Vertières, led by Haiti’s founding father Gen. Jean-Jacques Dessalines. Last year, Pres. Moïse had visited the Vertières monument, just outside Cap Haïtien, to announce the re-institution of the Haitian Army after its demobilization by former Pres. Jean-Bertrand Aristide in 1995. But this year Pres. Moïse had to cancel his planned visit due to the size and fury of the demonstrations there. Instead he gave a short 10-minute wreath-laying ceremony and speech calling for unity at the Museum of the Haitian National Pantheon (MUPANAH), located just 100 yards from the National Palace. By Nov. 20, the Associated Press reports eight deaths from clashes between the police and demonstrators, who have set up burning tire barricades and road blocks around the capital, Port-au-Prince. One of those dead was a policeman with the anti-riot Departmental Unit for the Maintenance of Order (UDMO), who was shot and his body burned on Monday. 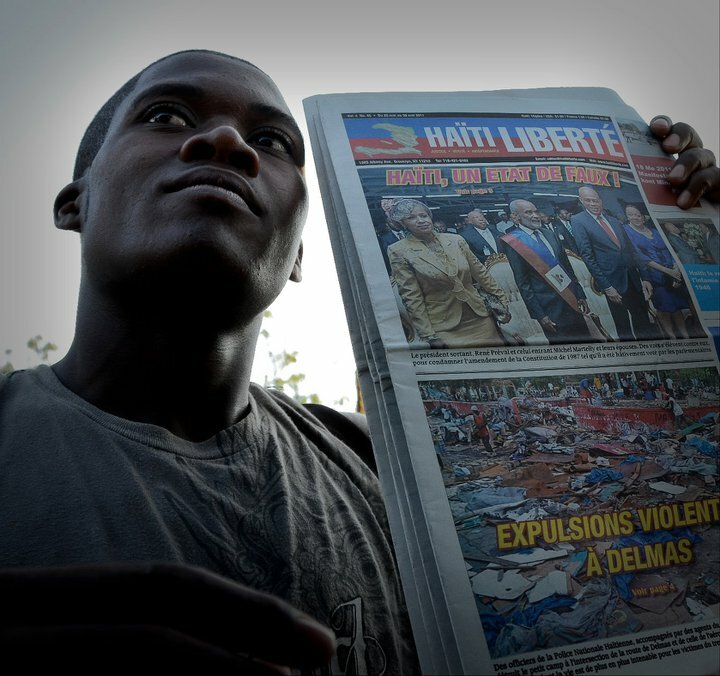 As of Nov. 19, the Haitian National Police (PNH) had given a death-toll of six, with five wounded, and 23 arrests. Meanwhile, the principal opposition group, the Democratic and Popular Sector, which is an alliance between outspoken lawyer André Michel and the Lavalas Family party (FL) of former president Jean-Bertrand Aristide, said in a press conference late Nov. 18 that 11 people had been killed, 47 wounded and 75 others arrested. There are many reports of police vehicles without license plates with masked, heavily-armored commandos in camouflage-fatigues circulating around the city. The population refers to “La Police” for the official force and “Le Police” (a deliberate grammatical error) for the apparent mercenary paramilitaries dressed and armed as police officers. There are also numerous reports of foreign soldiers (either U.S. or Dominican) being among both “La Police” and “Le Police,” with photographs of light-skinned masked “officers” on social media networks. While the source of many photos is unclear and light-skinned policemen not proof of being foreign, the popular perception is that foreign riot police and “snipers” are defending Jovenel and killing demonstrators. Faced with police bullets and tear-gas in the demonstrations, on Nov. 19 and 20, neighborhoods committees have preferred to barricade roads to paralyze traffic and commerce in the capital. 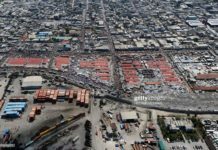 The most shocking death-toll was on Nov. 13 in the Port-au-Prince neighborhood of La Saline, where at least 15 people were killed, six women raped, and 15 houses sacked, according to a report by the newly-founded Open Eyes Foundation (Fondasyon Je Klere or FJKL), headed by former Sen. Samuel Madistin and researcher Marie Yolène Gilles, formerly of the National Human Rights Defense Network (RNDDH). Photographs and videos of the victims’ mangled rotting corpses in piles of garbage, sometimes with pigs eating their entrails, went viral on Haitian social media networks. According to the FJKL report, the massacre was the result of a La Saline gang allied with Pres. Moïse’s Haitian Bald-Headed Party (PHTK) attacking another group allied with the opposition. In short, “political exploitation” of a simmering territorial conflict turned La Saline into a gruesome “theater of armed clashes,” the report concludes. 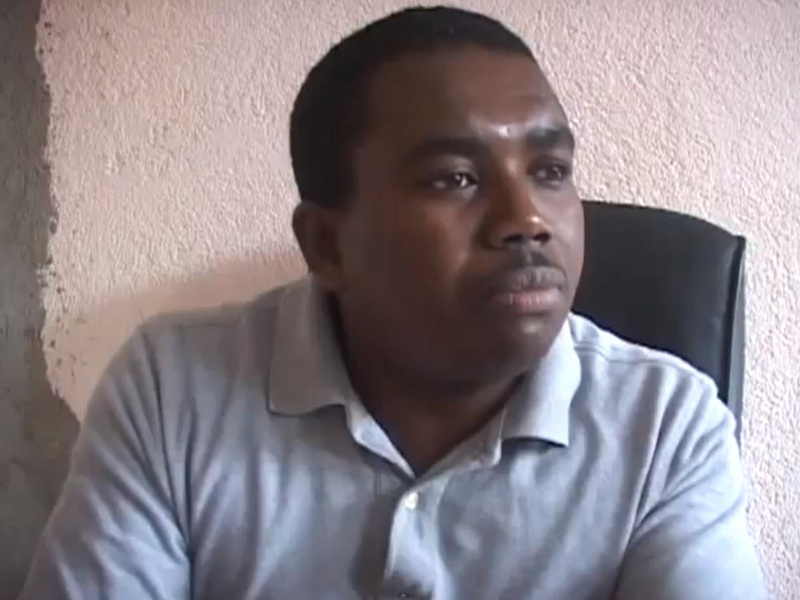 The Lavalas Family was more pointed saying it “strongly condemns the massacre that the Jovenel and [new Prime Minister Jean-Henry] Céant regime conducted in La Saline where they assassinated many innocent people,” saying the dumping of bodies in garbage was how “this criminal regime engages in terror to prevent the battle of Vertières commemoration from putting an end to their misdeeds.” The statement was signed by the FL’s Executive Committee members Dr. Maryse Narcisse, Dr. Jean Myrto Julien, and Joël Vorbe. As we go to press on the evening of Nov. 20, it appears likely that Pres. Jovenel Moïse will be chased from power well before the end of his five-year mandate in February 2022. Probably, PM Céant will be ousted with him. The big question is: what will follow? To answer this, it is important to understand the three principal forces vying for power, all under a Washington-guided United Nations military occupation. Jacky Lumarque, Préval’s protégé, heads the current known as the PetroChallengers. This sector represents Haiti’s “enlightened bourgeoisie,” until last year led by the late former Pres. René Préval. Today, it is unofficially headed by Préval’s protégé and foiled presidential candidate Jacky Lumarque, Quisqueya University’s rector. In his team are figures like Préval’s former prime minister Michèle Duvivier Pierre-Louis, and bourgeois businessmen like Reginald Boulos and Dimitri Vorbe. 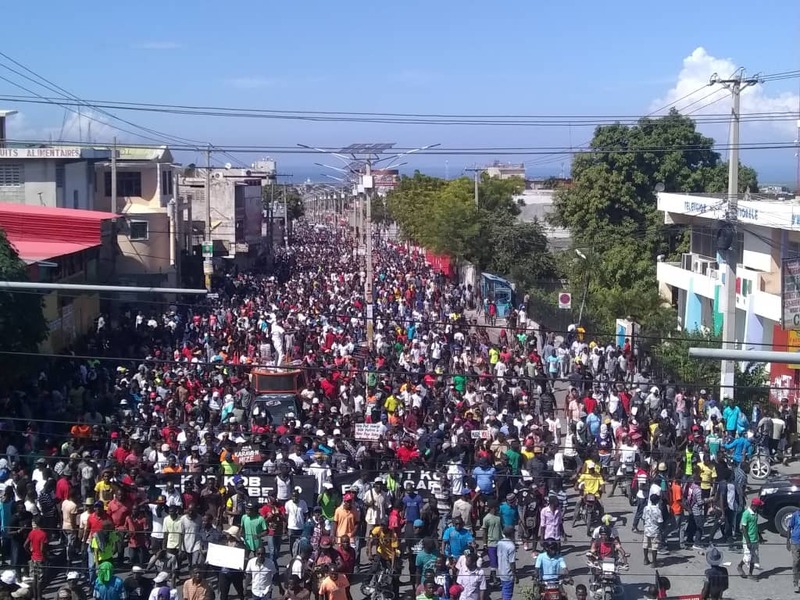 The PetroCaribe Challenge called and did most of the organizing for the gargantuan Nov. 18 demonstration in Port-au-Prince, but its limited demands for PetroCaribe transparency and justice have been surpassed by the searing calls for Jovenel’s ouster. 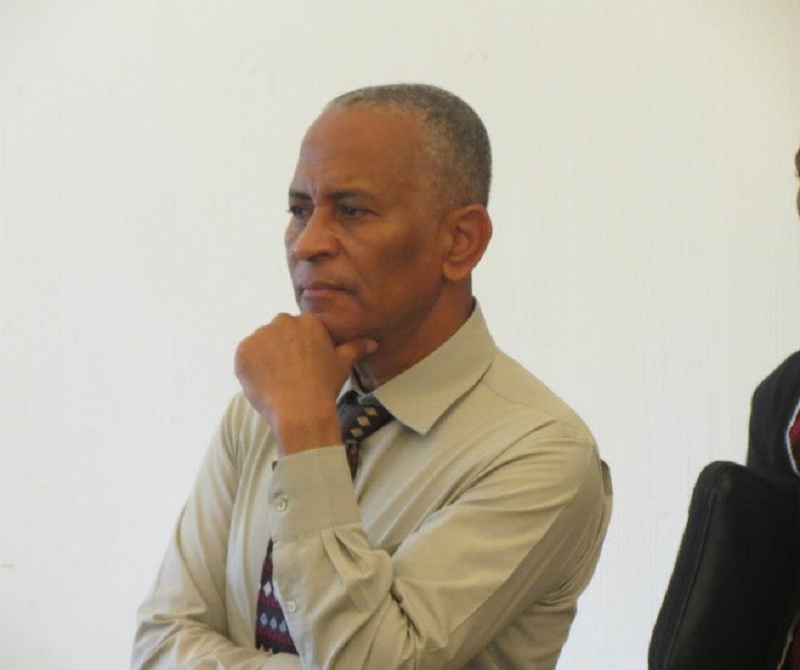 Activist lawyer André Michel heads and speaks for this current, but its principal strength comes from the Lavalas Family party. Ironically Michel was once a leader in the Democratic United Committee (KID) with former PHTK Prime Minister Evans “K-Plim” Paul. In that role, he was a part of the Washington-backed “Group of 184,” a coalition which spearheaded the 2004 coup d’état against Aristide. But today he and FL have joined in a coalition whose principal goal is to oust Moïse. Lawyer André Michel is the principal spokesman and leader of the Democratic and Popular Sector. However on Radio Caraïbes, Michel has repeatedly proposed a transitional government headed (as the Constitution dictates) by the Supreme Court’s chief justice, but the government would include PHTK ministers. This half-stepping concession is reminiscent of when, during a similar nationwide uprising in late 2014, the FL opposed demanding the the resignation of former President Michel Martelly, hence braking the movement and allowing Martelly to finish his term. The third contender for power is the Platfòm Pitit Desalin of former Sen. Moïse Jean-Charles, who split from the FL in December 2013. Although he was Pres. 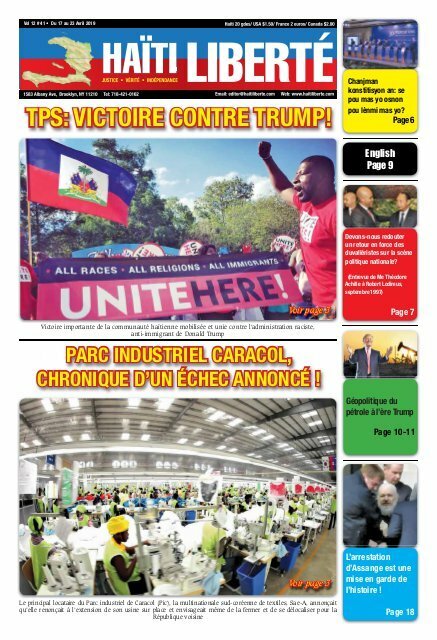 Martelly’s most outspoken critic and an apparent anti-imperialist champion from 2012 to 2014, leading the charge for UN troops to leave Haiti and to stop all steps towards environment-trashing gold mining in Haiti’s north, he plunged into the presidential elections of 2015 and 2016 (despite having said he would not run under UN occupation or Martelly’s presidency). Alienating his leftist comrades, Moïse Jean-Charles made many dubious alliances with rightist or opportunist figures like Gabriel Miracle, Valéry Numa, Mathias Pierre, and Assad Volcy. With all of them, he ended up at daggers drawn. In his latest political somersault, Jean-Charles led a march through Cap Haïtien on Nov. 18 carrying, not the red-and-blue bicolor of the revolutionary forces (now Haiti’s flag) at Vertières in 1803, but the red-and-black flag which has become the symbol of the Duvalierist dictatorship (1957-1986). Dessalines’ 1805 Constitution mentions making a red-and-black flag for Haiti, but the flag was never flown under him. He was assassinated on Oct. 17, 1806. But François “Papa Doc” Duvalier resuscitated the red-and-black flag as a demagogic ploy to justify his racialist ideology (called le noirisme or Blackism) aimed at mystifying Haiti’s masses that their enemy was a mythical “mulatto elite” rather than a multiracial ruling class of big-landowners and the comprador bourgeoisie. He sought to obfuscate that Haiti’s social problems are based on class, not race. Moïse Jean-Charles being carried on the shoulders of a supporter. On Nov. 18, he rallied in Cap Haïtien under a red-and-black Duvalierist flag, claiming it was Dessalines’. In the same way, certain historians have distorted Haitian history to suggest that Dessalines represented and championed the black masses but was betrayed and assassinated by mulattos, represented by presidents Alexandre Pétion and Jean-Pierre Boyer. In truth, Dessalines was surrounded by loyal and trusted mulatto aides and officers, while those who planned his ambush and assassination included many blacks, among them president Henri Christophe. Moïse Jean-Charles’ resurrection of the red-and-black flag is a stealthy thrust at his two rival factions in today’s uprising. Both the PetroChallengers and the Michel/FL group have prominent bourgeois figures in their leadership. Jean-Charles is using coded racialist slogans and symbols, like the Duvalierist flag, to posture as the Haitian masses’ champion. He is also making an implicit invitation to Haiti’s Duvalierists, who will be seeking another banner under which to rally now that the PHTK is imploding. Ironically, former dictator Jean-Claude “Baby Doc” Duvalier’s son, Nicolas, is also a presumed contender for the 2021 presidential elections and has been photographed posing often with the red-and-black flag. 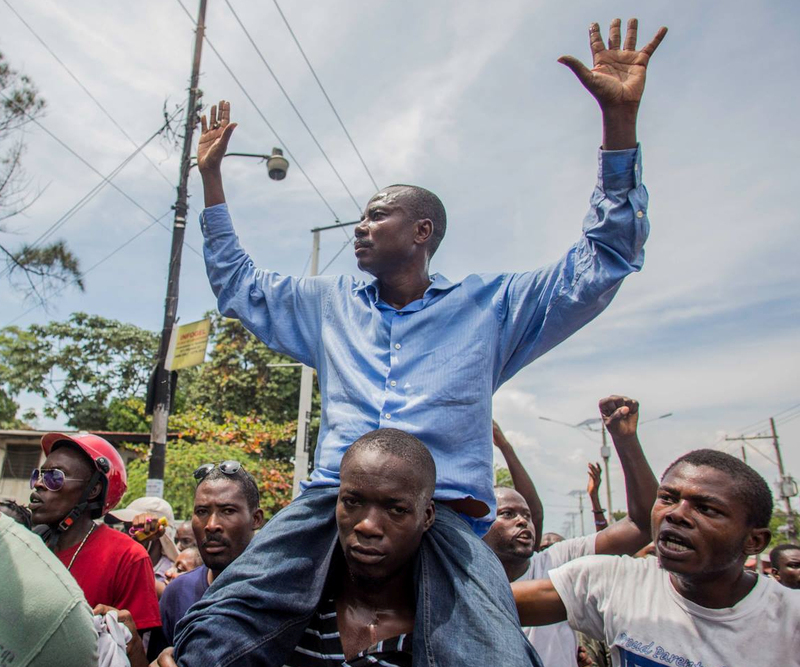 The tens of thousands who marched, mostly peacefully, on Nov. 18 were primarily demanding the resignation of Jovenel Moïse. This is the principal call of the Michel/FL coalition and Dessalines Children, but it was not for the PetroChallengers. In this sense, the Lumarque current has been outstripped, for the moment, by the other two sectors. But one element which all three factions share is a studious reluctance to point to the 800 pound gorilla in the room: the military occupation force known as the United Nations Mission to Support Justice in Haiti (MINUJUSTH). 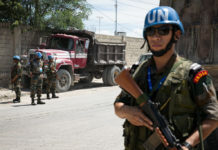 Although consisting of only about 1,300 armed UN police officers who are deployed throughout Haiti’s 10 departments, the force is in powerful, key positions in PNH headquarters and police stations, to monitor and advise or dictate armed action. Furthermore, they are deployed under Chapter 7 of the UN Charter, meaning the UN Security Council is the final authority in Haiti, not any elected or appointed Haitian leader. The Security Council essentially has a boot-toe in Haiti’s door. It can deploy 10,000 troops at any time if it so decides. Unless the PetroCaribe and “Oust Jovenel” movements adopt a clear anti-imperialist and anti-occupation message and line of march, the next government that comes to power will most likely be concocted by the U.S. Embassy, as it was in 1986 with the National Council of Government (CNG), in 1991 with Prime Minister Jean-Jacques Honorat, in 2004 with Prime Minister Gérard Latortue, or in 2016 with President Jocelerme Privert. At this time, Haiti’s revolutionary, anti-imperialist left is not as organizationally and financially strong as the three currents outlined above. But their message resonates with the Haitian people, where they have deep roots. Any revolutionary moment throughout history is extremely fluid, filled with reversals, rises, and falls. Such unusual dynamics have a strange ability to level the playing field for all class forces, including workers and peasants. What is often determinant is the persistence, experience, organization, and will of Haiti’s truly revolutionary forces to forge a unity and common strategy. Next articleLe directeur général de la PNH clarifie !